On 31st August 2016 ACADEMIC CLUB of JIMS organized a competition for all those who are good in numbers of the college. 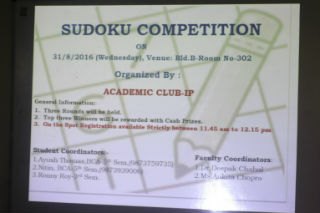 The event was called “THE SUDOKU COMPETITION”. As we all know Sudoku is a logic-based combinational number-placement puzzle. So it was what participants had to do, all the participants taking part in each round/level were given a partially-filled grid of 9x9 squares divided into 3x3 sub-grids which were to be filled with numbers ranging 1 to 9. 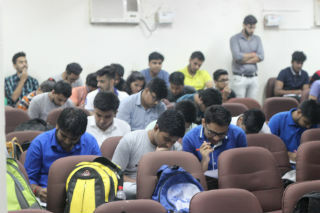 Around 60 students participated in the first round that is the “Easy level”. They were given 15 minutes to complete the grid. The ones who completed the grid correctly and before time were qualified to the next level/round. 26 students qualified to the second round that is the “Intermediate level”. They were given 15 minutes and a grid with more difficulties to solve. 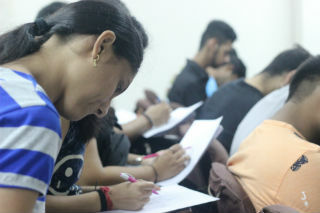 The basis for qualifying was same as the previous round and the ones who finished early received a benefit over others. Finally only 11 students got qualified for the final round that is the “Expert level”. The grid was way more difficult and the allotted time for this one was 15 minutes. After 15 minutes all the grids were evaluated and the winners were announced. Radhika of BCA IIIrd year grabbed the first prize with her complete and correct grid which she submitted before the time completed. 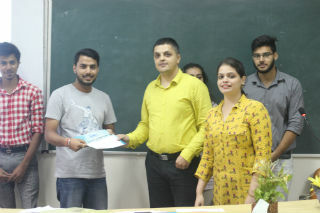 Himanshu Bansal of BCA IIIrd year also got the complete and correct grid and secured 2nd position. 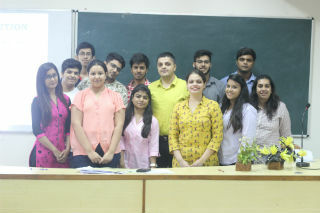 Himanshu Aggarwal also from BCA IIIrd year made his place in the top 3 by securing 3rd position. . 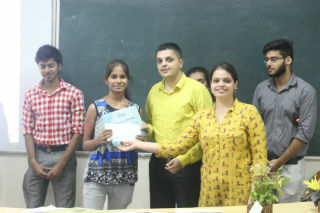 The winners were given certificate of appreciation along with the prize money.